I imagine for younger folk, it’s inconceivable to imagine a world without the WWW. When I first started out, I devoured as many guitar making books as I could find. Amanda, then girl-friend, worked for a publishing house, so when in 1976, I wanted a copy of David Russell Young’s book she wrote to the American publisher, waited for a letter to come back with the cost etc, bought an international money order, posted it to the States and waited……………. Like many, I still like a physical book and have quite a lutherie library but sometimes descriptions of making techniques can be a bit lacking. 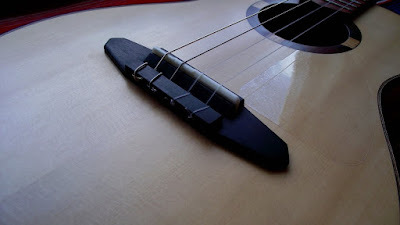 Try, for example, looking up, in one of the definitive books, “how to join an archtop back plate together.” Wouldn’t be easier to look at a video on YouTube? And here’s the aforementioned back fully carved………. Do digital cameras wear out? I don’t know, but we bought a new one and hey-presto! I’ve made up the neck blank and you can see that I’ve used Brazilian rosewood for the head overlay. The inlay is from black pearl; I like its subtlety; in some lights, it disappears into the wood! The neck itself is maple with a rosewood core, you can see that I’ve started to carve the volute. 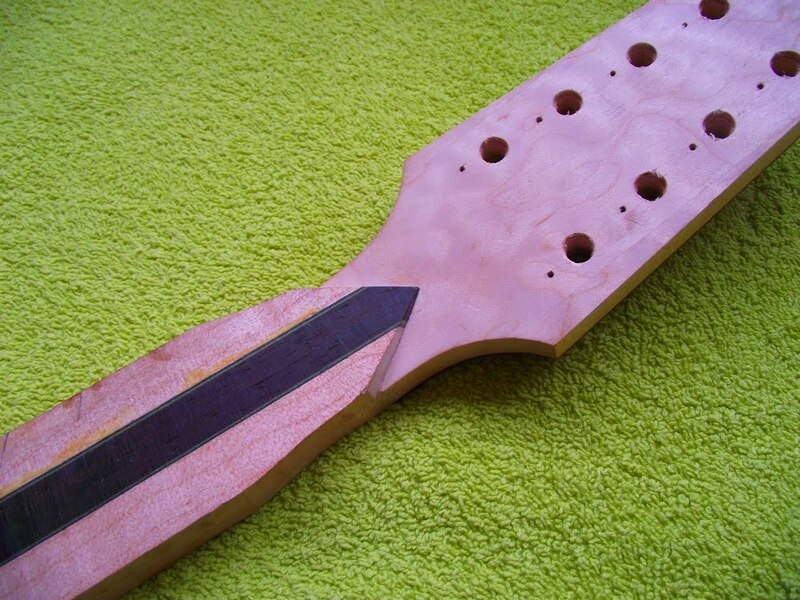 I cut up a billet to use for the fretboard and was really surprised by the bright rose-pink colours (is that why, along with its sweet, sickly smell, someone named it “rosewood”?). Quite a spectacular pieces of wood, although the colours will tone down over time, I’ll have to decide whether it’s a step too far! Whilst we’re waiting for the Tru-oil to harden on Dave’s e-mando, no good twiddling thumbs, on with the next archtop! 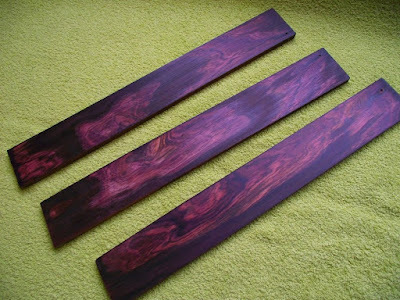 Over the years, I’ve built up quite a collection of exotic tonewood, and I feel a responsibility to use it in the best way that I can. As the pieces aren’t particularly large, I need to be imaginative. So, for my next archtop mandolin, I’m going to incorporate into its construction, as much Brazilian rosewood, from my collection, as I can. One aspect that will be a bit unusual is that although I’m using the Rio for the sides, its carved back will be made from figured maple. I’m going to do another series of videos, but try to cover different aspects of the build, not covered in the previous two build video series. So here’s the first dealing with bending the sides and making the rim. As I’ve been applying Tru-Oil ( one coat a day) to Dave’s e-mando, I thought it a good time to finally complete the baritone uke that I started about 6 years ago! As I’ve said before, my baritone ukes are just not economically viable to build any more. 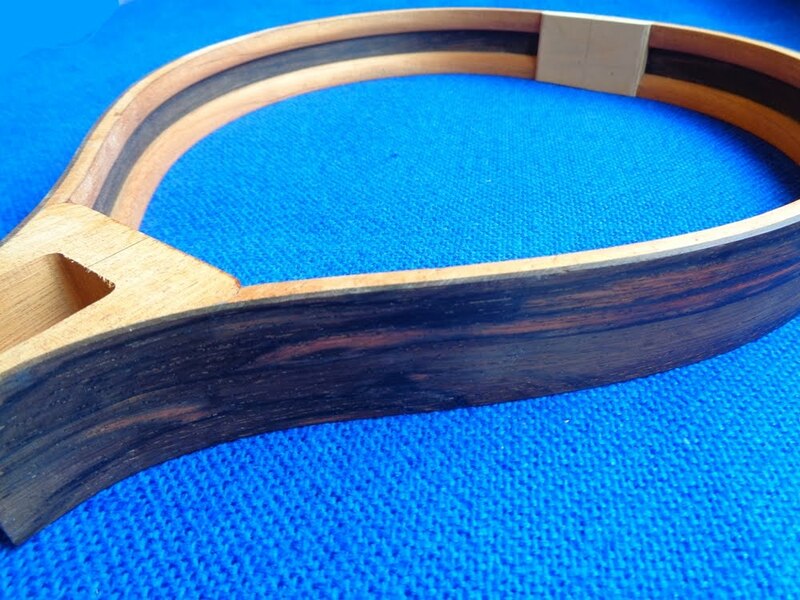 It’s very much built as a small classical guitar; fan-braced, dovetail neck joint, double hole bridge etc. and takes almost as much time to build as a guitar. So, as this instrument isn’t a commission, I’ll probably hang on to it for a while unless someone makes me an offer I can’t refuse! 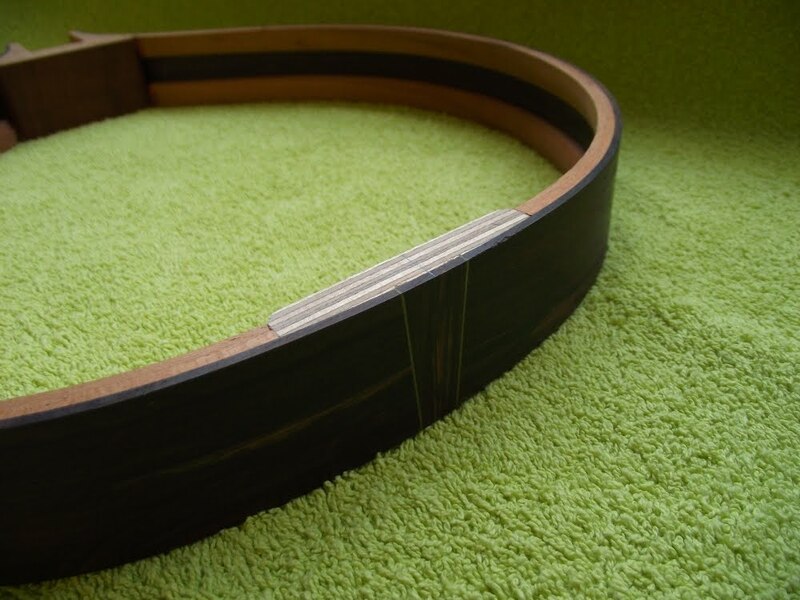 The soundboard is Engelmann spruce with a cocobolo rosette, fretboard and head overlay. I’ve used the sapwood for decorative effect. The bridge is ebony with a bone saddle (bone nut too) and has a classical guitar style double hole tie-block. The tuners are Gotoh guitar tuners and I’ve replaced the chrome buttons with ebony ones, which saves an appreciable amount of weight. 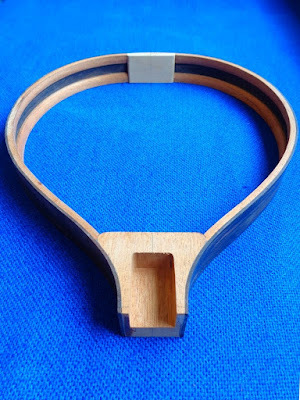 The body is fully bound and the whole instrument finished in light satin shellac and wax finish. I’ve used a clear pick-guard to offer some protection. 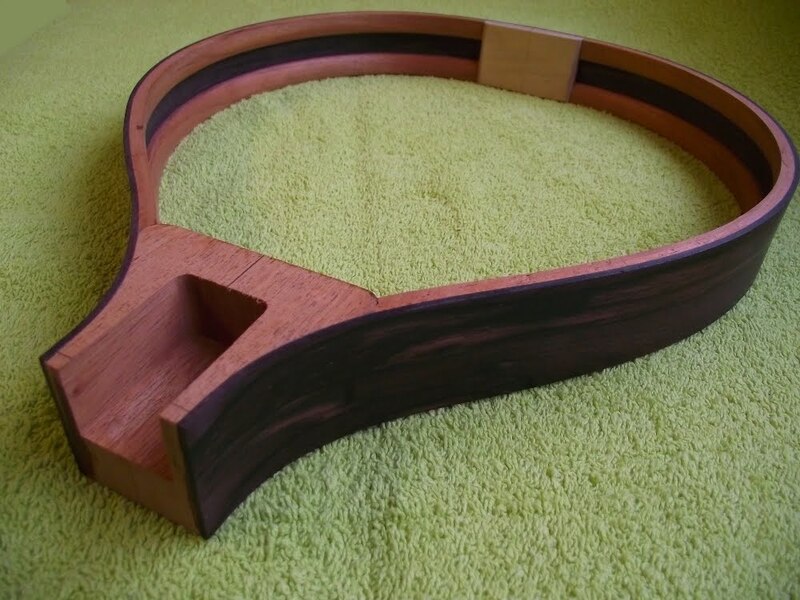 The back and sides are made from some figured sycamore and the neck, Spanish cedar. There is also a carbon fibre reinforcement strip in the neck. The back is inlaid with a decorative marquetry stripe. You’ll be used to seeing my mandolins set-up in the white; a phrase pinched from violin makers, i.e. before they apply that coloured varnish that seems to appeal. 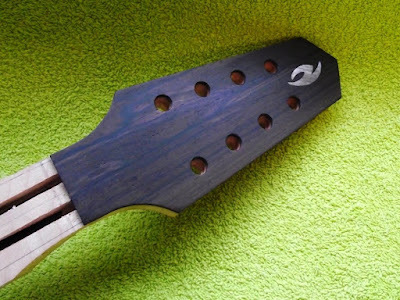 Dave’s e-mando has reached the stage where I’ve been getting it set-up prior to applying the finish, and as there’s not a bit of white wood anywhere to be seen………. I’ve got a spare pick-up that I use at this stage i.e. setting the action and intonation etc. As this one doesn’t have an under-saddle transducer, I thought I’d build an adjustable bridge (it will make action adjustment much easier for Dave). It took a fair bit longer to make than I thought and a couple of goes to get it right and it still needs some tidying up, but that said, I’m really happy with its performance. Whenever you go off-piste, you have to be willing to spend extra time designing and developing your ideas. I’ve included a photo of me with the octave e-mando so that you can get a better idea of its size.